Chuck Hagel -- a man without a party… And a man who has a tough confirmation fight ahead… The nut of the Hagel fight, and why Obama is sticking with him… Kerry-Hagel-Brennan -- a Team of Loyalists… McConnell on the upcoming fiscal fight… White House’s “far broader” and “more comprehensive” campaign to curb gun violence… And Hillary Clinton returns to work. The Daily Rundown's Chuck Todd reports on President Barack Obama's latest additions for his cabinet. *** Hagel -- a man without a party: This afternoon, President Obama will tap former GOP Sen. Chuck Hagel to be his nominee to lead the Defense Department. Hagel’s biggest obstacle to confirmation isn’t his controversial comments about Iran and Israel or his “overly aggressive gay” remark. Rather, it’s that he’s a man without a party. If Hagel were a Democrat, for instance, you would have seen someone like Sen. Chuck Schumer (D) embrace his potential nomination on “Meet the Press” recently instead of being tepid about it. And if Hagel were a true-blue Republican -- having campaigned for Mitt Romney and other GOP candidates last fall -- you wouldn’t have seen folks like Sen. Lindsey Graham (R) speak so critically of him. But Hagel’s in no-man’s-land territory, the place where the public says it wants many public officials to be, but where Washington can eat folks like this alive. He’s a Republican who later opposed the Iraq war, whose wife endorsed Obama in ’08, and who campaigned for Democrat Bob Kerrey in 2012. In recent times, every cabinet nominee from the opposition party (Bill Cohen, Norm Mineta, Bob Gates, Ray LaHood) has sailed through easily. But since we started covering politics, Hagel might be the first cabinet nominee from the opposition party who doesn't have the backing from that party. It’s amazing how things can change: Republicans universally support John Kerry for Secretary of State, but oppose Chuck Hagel for Defense. Senator Chuck Hagel, R-Neb., attends a meeting in the Cabinet Room at the White House in this file photo from Oct. 28, 2009. President Obama is set to name a new secretary of defense today, and his pick, Republican Chuck Hagel, a former senator from Nebraska, faces opposition not only from Democrats, but from some within his own party as well. NBC's Chuck Todd reports. 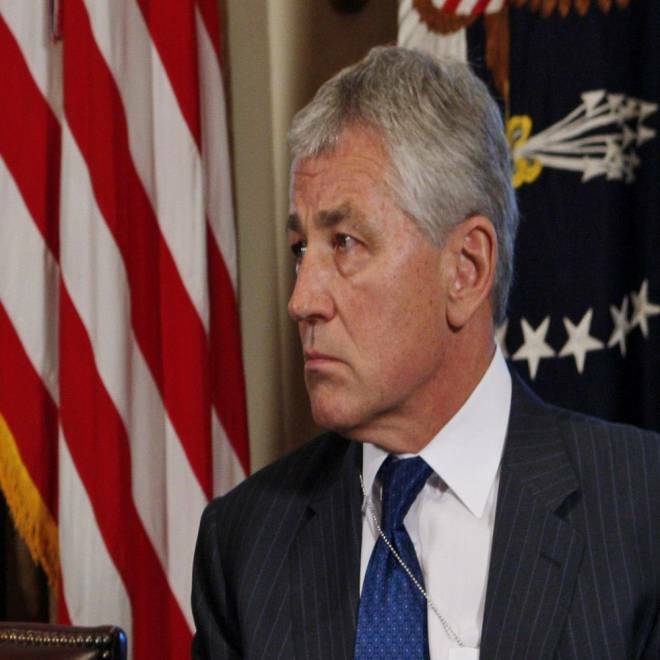 *** The nut of Hagel fight: There are two basic lines of attack against Hagel. One has to do with whether he’s a true ally of Israel. Detractors point to some votes Hagel made when it came to Hamas and Hezbollah, as well as some votes on Iran sanctions. But supporters of Hagel note he always voted in favor of full funding of Israel aid and did sign on to key pieces of legislation that did target Iran’s nuclear program and did target Hamas. Then, of course, is the quote attributed to Hagel where he referred to pro-Israel groups as “the Jewish lobby,” which is offensive to both pro-Israel supporters and Jews who do not like to be lumped in with the AIPAC’s of the world. Gay rights groups are not excited at all about Hagel because of comments the Nebraska Republican made against a gay ambassador nominee from the Clinton years, when he referred to James Hormel as “openly aggressively gay.” Former Congressman and (and potential TEMPORARY Massachusetts senator) Barney Frank has been highly critical. So there is a lot of “cover,” if you will, for someone on the left or right who WANTS to oppose Hagel to find a political reason to oppose him. But realize, some of the real reasons for folks to be against Hagel won’t be the issues we discussed above. For some Republican senators, it will simply be the fact that many of Hagel’s former Republican colleagues have not gotten over Hagel’s high-profile flip on the Iraq war. And for some Democrats, it’s the frustration that the president is turning to his SECOND Republican to run the Defense Department. Dan Senor, the co-found of the Foreign Policy Initiative, and Steve Clemons, the Washington Editor-at-large for the Atlantic and Senior Fellow at the New America Foundation, debate the nomination of former Sen. Chuck Hagel. *** Why Obama is sticking with Hagel: So with all this potential political controversy surrounding Hagel, one might ask, “Why is Obama sticking by him?” There are two big reasons. One, he likes the idea of a man who wore the uniform who will NOT be intimidated by the generals at the Pentagon. And two, with the budget fights dominating the next few years in Washington and the issue of downsizing the Pentagon on the table, what better person to have leading the downsizing argument than a former Republican senator. *** A Team of Loyalists: In addition to making the Hagel pick today, President Obama will announce White House counterterrorism adviser John Brennan to be his nominee to head the CIA, NBC’s Andrea Mitchell reports. Officials argue that, since 9/11, he has been at the forefront, on the front lines against al Qaeda. He has been involved in virtually "all major national security issues and will be able to hit the ground running at CIA,” the officials add to Mitchell. Brennan also has the complete confidence and trust of the president. And that’s the big signal Obama is sending by picking John Kerry for State, Chuck Hagel for Defense, and John Brennan for CIA -- he’s selecting people with whom he’s comfortable and who are loyal to him. (And in National Journal, Ron Fournier writes that Hagel “is Obama in a GOP jersey,” and that’s his biggest problem.) Bottom line: These are Obama people. But these are also three white men, and you’re going to start hearing voices demanding diverse picks for the other cabinet positions. And that grumbling could get louder when, as it is expected, the president names current Chief of Staff Jack Lew to Treasury and elevates current dep. National Security Adviser Denis McDonough to Chief of Staff. This could end up being a very busy week at the White House on the personnel front. *** McConnell on the upcoming fiscal fight: The other big news today is over the upcoming political fight over the debt ceiling, the sequester, and government operations. On “Meet the Press” yesterday, Senate Minority Leader Mitch McConnell – who helped strike the fiscal-cliff deal with the Obama White House – didn’t disavow his 2011 comment that refusing to raise the debt ceiling is “a hostage that's worth ransoming." McConnell told NBC’s Gregory yesterday, “What we're saying here is the biggest problem confronting the country is our excessive spending. If we're not going to deal with it now, when are we going to deal with it? And we've watched the government explode over the last four years. We've dealt with the revenue issue.” When Gregory followed up to ask if tax revenue would not be part of the conversation, McConnell replied, “Yeah, that's over. I'm in favor of doing tax reform, but I think tax reform ought to be revenue neutral as it was back during the Reagan years. We've resolved this issue.” But McConnell also declined to answer if he would rule out a government shutdown. “What I'm telling you is I haven't given up on the president stepping up to the plate and tackling the single biggest issue confronting the country.” While McConnell was careful not to threaten a government shutdown, many of the Republican rank-and-file were not. *** Hillary Clinton returns to work today: After her concussion and her hospitalization due to a blood clot, Secretary of State Hillary Clinton returns to work today, meeting with her assistant secretaries at 9:15 pm ET.